A Comprehensive Solution to Combine Multiple Outlook PST Files into One With Items Like Emails, Contacts, Tasks, Journals, etc. Permits to merge Outlook data files items such as emails, contacts, calendars etc. Offer to remove duplicate emails, contacts prior merging. Compatible with Windows Operating system 10, 8, 7 & earlier version. The PST Merge software offers three different options to merge PST files. The options provided by the software are Join, Merge and Merge Contacts. With Join option, the user can join PST files by creating a new PST folder. Merge option permits the user to combine similar PST into single PST file. Merging Contacts option, let the user join contacts within PST. The PST join tool permits the user to join various Outlook PST files by creating a new folder to store the merged Outlook file. The user can select the option to add all the PST files under a common PST file. Each PST file will have the associated data with it in a respective folder. With this PST Combiner, the user can easily merge all the similar folders from two or more MS Outlook PST files like Inbox, contacts, calendars, drafts, sent items, notes, to-do list etc. into a single PST file. The PST file merge also permits the user to merge UNICODE and ANSI PST into single UNICODE type PST. 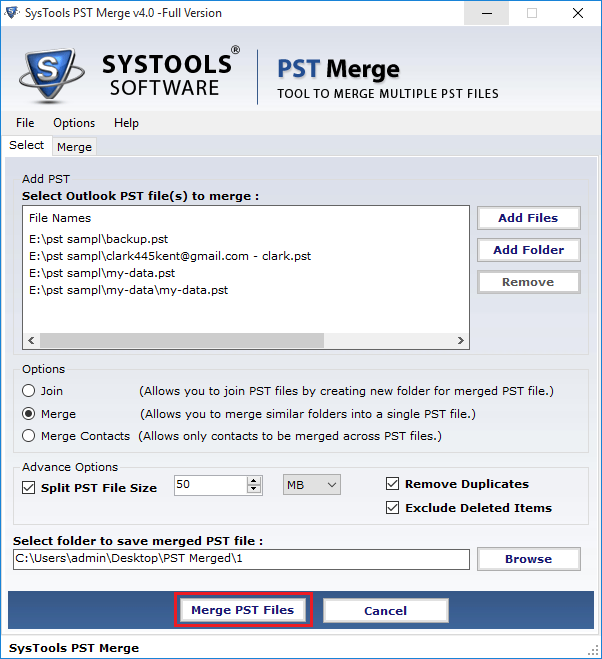 PST Merge software allows the user to merge Outlook contacts folders to multiple Outlook data files into single PST file. The tool will create a single PST file having all contacts merged into one folder. Additionally, the meta properties of the contacts such as name, contact numbers, company name, email addresses are also maintained by the utility. The PST Merge software permits the user to merge multiple PST files into single PST. Moreover, it also provides a smart feature to remove the duplicate items. The user just has to check/uncheck the Remove Duplicate option to include or exclude duplicate items. The user does not need to add each PST file one by one to combine multiple Outlook data files together. 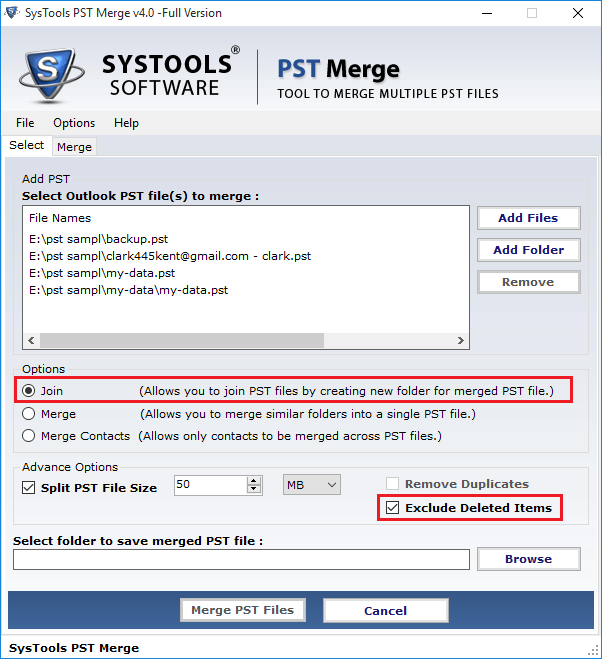 The PST combiner provides Add Folder option to integrate two or more PST files at once and perform the merge Outlook folder process in bulk. The user can easily exclude the deleted item folder while merging two Outlook PST data files into one. The user has to check the option to eliminate the deleted item folder. The PST combiner will not merge the deleted item folder into the output merged PST file. After the completion of the merging process, the PST merger will generate a report containing details related to the merge process. The report will include the number of PST files, the name of PST file, duplicate items found, total item count and the merge status. Why Outlook User Need to Merge Outlook PST Files into Single PST File? It is very difficult for Outlook user to manage multiple Outlook PST file at the same time. Each time he has to switch between Outlook PST files to looking for the crucial emails and other items. So, the need of merging multiple Outlook PST files into one arises. Now big question is that how to merge Outlook data files into single PST files. How to Combine Multiple Outlook PST Files into Single PST File? As it is clear from the above section that there are multiple reasons for the merging of multiple Outlook PST files into single files. The manual technique to merge Outlook PST files into one is available which comprises of two parts. Import data from PST file to newly created Outlook PST file. The manual solution is not simple and easy as it seems in first glance. 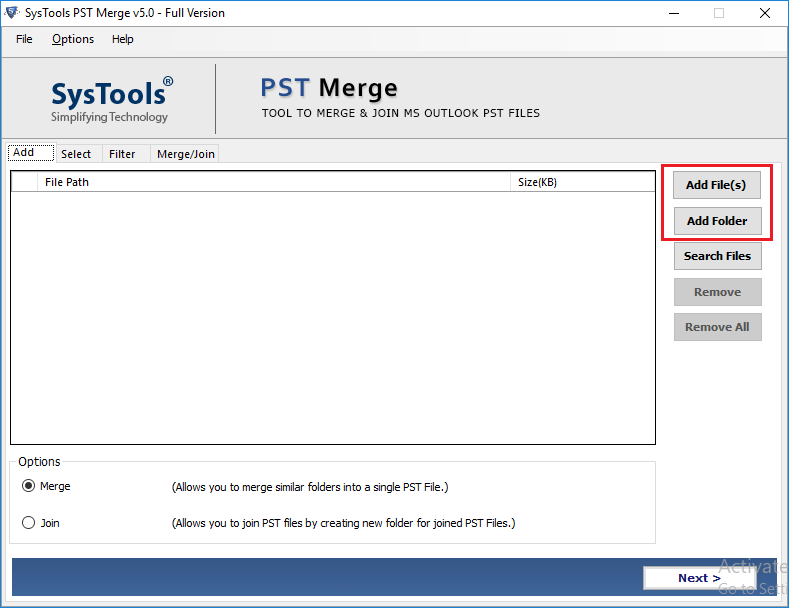 So, you can use PST merge tool to easily combine multiple Outlook PST files into one without any complications. It provides 3 unique option to merge Outlook data files into different manner. It also facilitates to remove duplicates emails, contacts prior to merging of multiple Outlook PST files. PST Merger provides you an additional option to include or exclude deleted items. I was frustrated with managing multiple files at the same. Opening or closing of PST files consumes my lots of time which ultimately effects my productivity. So I decided to merge them into single PST file and for the same, I used EmailDoctor PST Merge tool. It provides ease with efficiency. Thanks for helping me. Does the software support Windows 10 Operating system? Can I exclude duplicate items while merging PST file with the software? Yes, the PST Merge software provides Remove Duplicates option to eliminate the duplicate items. Is there file size limitation associated with the software? No, there is no file size restriction linked to the PST Merge software. Does the utility support Microsoft Outlook 2013 PST files? Yes, the PST join tool supports Microsoft Outlook 2019/ 2016/ 2013/ 2010 and all the below versions PST files. With PST Merge software, I was able to merge PST files into single PST file without any hassle. Moreover, there was no change in the PST files data after merging process. It is an amazing and user-friendly software. Thank, developers for PST Merger tool. I need to merge only the PST file contacts, I was not able to find a quick and simple way to complete this task. Then one of my friends suggested me PST Merge software. This PST merge tool just worked like magic. Within just a few clicks I was able to merge contacts across the PST files.